Whales from both poles migrate long distances to breed in tropical waters. Smithsonian scientist Hector M. Guzman and Fernando Félix at the Salinas Whale Museum in Ecuador, tagged 47 humpbacks with satellite transmitters to understand how the humpbacks' Southeastern Pacific population moves within breeding areas. "Our work fills an informational void: we've known these whales move between feeding areas and breeding areas, but we hadn't characterized their movements, and we couldn't exactly pinpoint the range of the breeding area," said Guzman, marine ecologist at the Smithsonian Tropical Research Institute (STRI) in Panama. "Now we know that individuals move between countries within the breeding season and that their entire breeding area extends approximately 2,600 kilometers of non-straight coastline from Costa Rica to Peru." For years, scientists have identified individual humpback whales (Megaptera novaeangliae) based on their unique fluke and dorsal fin patterns. In this study funded by STRI, Panama's National Office of Science and Technology, the Candeo Fund at the International Community Foundation and the Whale Museum, 25 whales were satellite tagged in Panama and 22 in Ecuador between 2009 and 2015 according to methods approved by the Smithsonian's Animal Care and Use Committee (IACUC). On average, tags transmitted for about two weeks, although one tag lasted for 69 days during which a mother whale swam nearly 6,000 kilometers. Information from the 37 tags that transmitted for at least 1 day revealed the movements of 23 mothers accompanied by newborn calves and 14 unsexed animals. "Thanks to new spatial models that were used to evaluate the movement of the whales, we could differentiate behaviors and gauge the speed of the whales during their reproductive and migratory periods," Félix said. Part of the Southeast Pacific humpback whale population breeds in Panama's Las Perlas Archipelago and in the Gulf of Guayaquil in Ecuador. 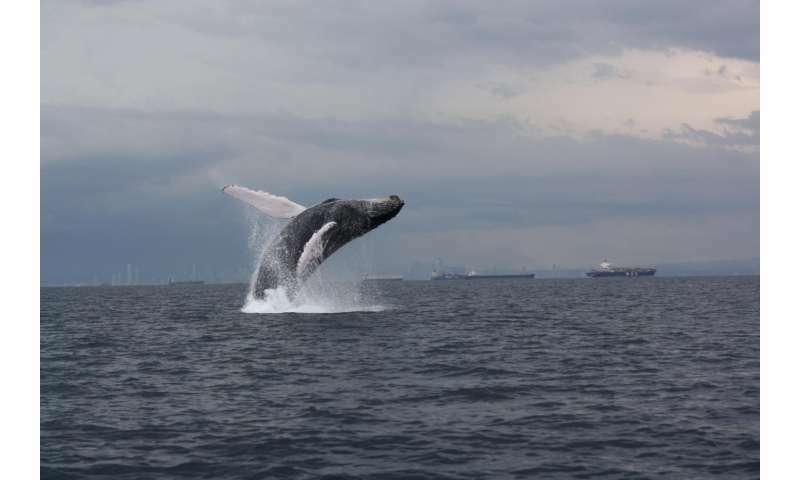 The roughly 60,000 square kilometers of home range of the group in Panama was about twice the size of the home range of the group breeding in Ecuador—about 26,000 square kilometers, which means whales are not randomly distributed but show site fidelity. Whales tended to spend time in short-range movement, alternating with long-range, faster, directed movement. Mothers spent more time closer to shore than other tagged, unsexed individuals. 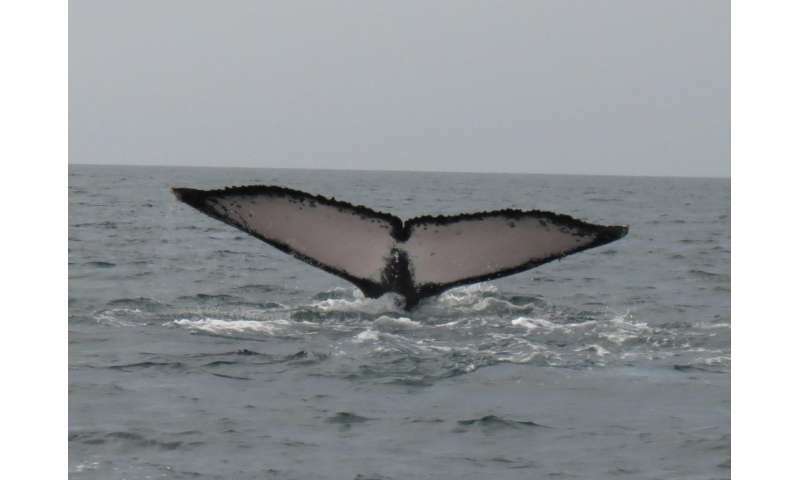 Both types of whales swam into deeper waters mainly during migration. Mothers in Panamanian waters spent much more time in long-range movements than did mothers in Ecuadorian waters, perhaps because they were shifting from a nursing phase to a migratory phase. Guzman and Félix suggest that the overlap between breeding individuals exhibiting short-range movements and non-breeding individuals exhibiting long-range movements at the same sites creates confusion about how many animals are breeding at a given time. This is especially true in Ecuador because individuals breeding in Colombia, Panama and Costa Rica pass through on North-South migrations. Humpback whales were once hunted nearly to extinction. Since the 1966 hunting moratorium, populations rebounded to more than 80,000 humpback whales in the world. But as human populations grow, the number of oil and gas terminals, offshore platforms, new ports and marinas is on the rise and coastal pollution, and traditional activities such as fishing and maritime traffic are intensifying. "Our breeding range analyses provided the first-ever insight at such a fine scale on the distribution of humpbacks and the coastal space they use for breeding and migration, particularly for mother/calf pairs," Felix said. 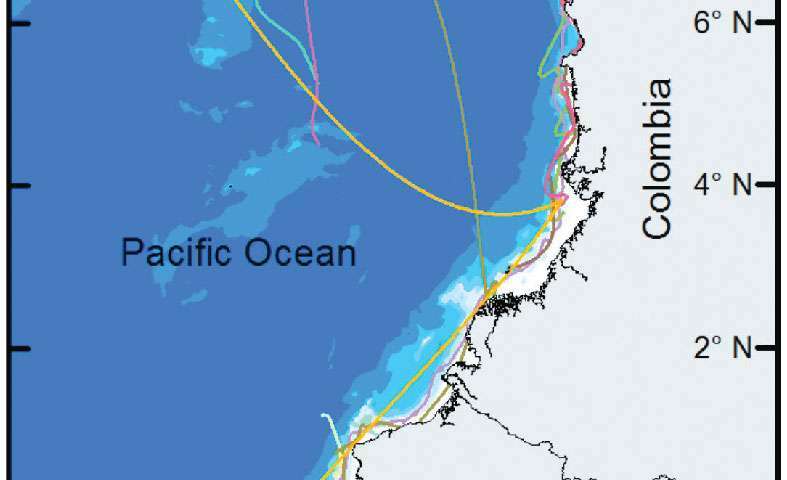 "We hope our density-distribution maps are carefully considered by the oil industry and governments planning seismic exploration in coastal areas along the North-South breeding axis of this species from Costa Rica to Peru," said Guzman. "Strong scientific evidence suggests that cetaceans behavior can be affected by this activity several kilometers from the exploration area." "By satellite tagging these animals we can better predict the impact of human activities on populations that are recovering by about 6 to 10 percent each year," Guzman said. "There are more whales to take care of now, and there's still a striking absence of policy governing the location of human activities, especially with increasing coastal maritime traffic overlapping migratory routes and oil exploration." In a second study off the coast of Chile, Guzman and Juan Capella from Whalesound followed a group of seven out of 25 whales tagged in the Magellan Strait to see if tagging affected their behavior or health during a period of several years. Tagging did not seem to affect whale behavior or their health or reproduction. Indeed, a female returned to the feeding area twice with new calves three and six years after tagging. Several individuals had small scars or lumps near the tag site, but they completely healed within two years. This study provides evidence to assist IACUC decisions by taking animal welfare into consideration. "We found the use of satellite-transmitter implants for remote tracking is harmless to the whale's health and breeding success, and doesn't damage the whales' bodies or alter their behavior but provides an enormous amount of data to inform managers," Capella said. "Using biotelemetry multiplied the information that we have about this group fivefold. We hope this will help decision makers understand the needs of this highly migratory species and leads to excellent, state-of-the-art management strategies for their survival," Guzman said.